Vincent Willem van Gogh (Groot-Zundert, Holland, 1853 - Auvers-sur-Oise, France, 1890) was a Dutch Post-Impressionist painter and son of a minister. In Paris he met Camille Pissarro, Claude Monet, and Paul Gauguin; the latter shared living quarters with van Gogh in Arles for a scant nine weeks until the quarrels between the two impetuous painters spelled the end of their close collaboration. Van Gogh is noted for his thick applications of paint, his Still Life: Vase with Twelve Sunflowers is quite notable for his use of paint straight from the tube with minor brush work to smooth the edges of the dollops of medium. More brilliant still was the use of this technique to create texture in a supposedly two dimensional medium, so that the paintings were part painting and part sculpture as in Starry Night. After a quarrel with Gaugin (and possibly during a bout of epilepsy), he sliced off one of his ear lobes. His life ended at age 37 of an apparently self-inflicted gunshot wound. The works of his early Dutch period are somber-toned, genre paintings of which the most famous is The Potato Eaters. View of Paris from Montmartre, Paris Seen from Vincent's Room in the Rue Lepic, Terrace of the Café "La Guinguette" and others are based on a typical Impressionist interpretation. Vincent van Gogh painted several pictures using the techniques of Pointillism, e.g., Vase with Daisies and Anemones. Among his last works are religious works after Delacroix, The Pietà and The Good Samaritan, the masterpiece The Church in Auvers, and multiple landscapes and portraits. In September 2013, his long-lost Sunset at Montmajour was declared authentic. Portrait of Dr. Gachet (1st version) (van Gogh's most expensive painting). Twelve Sunflowers in a Vase, ca. 1888. Vincent van Gogh Guggenheim Collection. 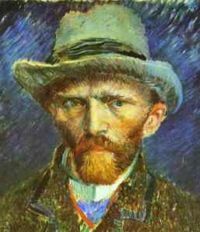 Vincent van Gogh: Biography Van Gogh Gallery. The Fondation Vincent van Gogh Arles. Fishing in Spring, the Pont de Clichy, 1887. View of Arles with Irises in the Foreground, 1888. Portrait of Joseph Roulin, 1889. A Road in Auvers after the Rain. 1890.